IT'S no secret that we Bangladeshis love to eat. With the arrival of Ramadan, although we cannot eat during the day, when it comes to iftar time we are back at our eating ways. And why shouldn't we eat? After all, Allah sent food to this planet for a reason, and that reason is for it to be eaten! Haleem: Iftar would simply not be enjoyable without this soupy delicacy made from lentils. This is an extremely popular item with us Bangladeshis, and this is clearly reflected from the numerous shops selling it. However, for safety's sake, you should be very selective about where you purchase haleem from. We recommend Kalabagan's Mama Haleem, as it has built a good reputation over the years. This year they are selling haleem in bowls that cost Tk 30, Tk 50, Tk 100, Tk 150, Tk 200, Tk 300 and Tk 500. As you can guess, the more costly bowl that you purchase, the more quantity of haleem you'll get. One word of caution though, and that is that unless you forcefully say "Ey aro mangsho dao", you'll probably not be given much meat with your haleem even if you make a purchase of the highest denomination. 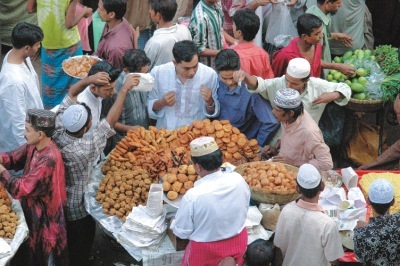 Jilapi: We Bangladeshis have a sweet tooth, and it is for this reason that jilapis come into the equation. 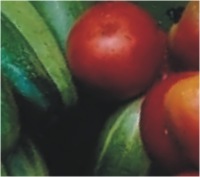 They are widely sold and their prices range from Tk 50 to Tk 120 per Kg. If you manage to come all the way to Uttara, you'll find some excellent jilapi at Mascot Plaza's Red Fort, and it is sold for Tk 120 per Kg. If you can't be bothered to carry out the long drive to Uttara, then you can try out Chilis' (Dhanmondi) jilapi. They are selling their jilapi for Tk 70 per Kg. Our only word of caution with regard to jilapis is that you should consume them in moderation, or else instead of enjoying Eid at the end of Ramadan, you'll find that you've been diagnosed with diabetes! Piazu and Beguni: These two items are sold at many shops too. Some shops sell them at Tk 2 each, but we would strongly advise you against purchasing them from these shops, as we found that they add chemicals to them in order to make them look more appealing to customers. If you have piazu and beguni from these shops, you'll probably have to spend the rest of Ramadan in the toilet! We recommend that you purchase them from Red Fort (Mascot Plaza, Uttara), as they are relatively free from chemicals and are stored in a hygienic environment. Both piazu and beguni will cost you Tk 5 each at this place. Boro Baper Pilau: Are you wondering what this is? Well, it's a delicacy that is made in the famous Chawkbazar. We were told that it is prepared using lentils, potato, minced beef, brain, liver, chicken, ghee, egg and various spices. When we visited Chawkbazar it was selling at a very brisk pace and therefore it must be quite tasty. If you would like to have something unconventional for your iftar, then definitely do try out boro baper pilau. It'll cost you Tk 180 per Kg. Shuti Kabab: This is another sought after item that is prepared in Chawkbazar. Mutton and beef are grilled with the aid of 'string' and that's why it's called 'shuti' kabab. The vendor that we spoke to was selling it for Tk 240 per Kg. He added that it can be purchased for less, but if you do so you'll probably get diarrhoea in no time! Puffed rice and Tchola: Puffed rice and tchola are sold all over the city and their quality doesn't vary much. They are sold for about Tk 44/Kg and Tk 60/Kg respectively. Chicken Samusa and Vegatable Samusa: These two items are widely available over the city, but we advise you to be selective from where you purchase them, or else you'll get that infamous disease called diarrhoea. At the branches of Helvetia, you'll be able to find these two items being sold in a hygienic environment. They'll cost you TK 10 each. Chicken Roll and Prawn Roll: Once again, we'll advise you to purchase these items from Helvetia. They're being sold for Tk 20 each. Chicken Shami Kabab and Beef Kabab: This is becoming a bit of cliché now, but again Helvetia is the place to go. They're can be purchased for Tk 15 each. Alu Chop and Doi Bora: We suggest that you buy them from KFC (Metro Shopping Mall, Dhanmondi). They're quite tasty and above all they're sold in a relatively hygienic environment. Their prices are Tk 3 and Tk 10 respectively. Dates: Many people invariably have dates for iftar. If you're one of them, then the good news for you is that they are widely available. Their prices range from Tk 60 to Tk 240. Bassboussa, Katayaf and Balal Sam: Even after having jilapi, if you're not satisfied with your sugar intake, then you can try these items. They're Arabic sweets that are sold at Helvetia between Tk 6 to Tk 15. Pathishapta Pitha: Winter is only a few weeks away, but if you'd like to get into the spirit of winter during iftar time, then you can have pathishapta pitha for iftar. At Chawkbazar, a box of 5-pathishapta pitha's is sold for Tk 60. Mattha: Wondering what this is? Well, it's a drink that is sold at Chawkbazar. Apparently, it helps to digest everything you have for iftar. So, if you've got problems with digestion, head to Chawkbazar and purchase this godsend drink. It'll cost you Tk 20 per Kg. Well, that's a pretty long list that we've provided you with. There are many items on the list for which you'll have to go to Chawkbazar. Although many of us have heard of this place, not all of us know where it is located. For those of you who are not savvy about Dhaka, Chawkbazar is near Dhaka Medical College Hospital. It's not the ideal place to go with your flashy car, as you'll end up getting several scratches if you do so! We suggest you take a rickshaw from Shahbagh (Birdem Hospital). The rickshaw fare will be about Tk 15. Anyway, that's enough from us for today. Enjoy your iftar!